√Soft and cozy precision knitting mermaid tail blanket , Eco-friendly and Skin-friendly perfect for kids or adults wrap. 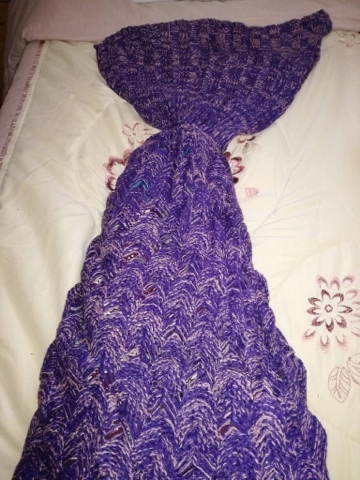 √Adorable and beautiful mermaid tail blanket, like a sleeping bag, could fit your feet go in fins, warm your feet. √Easy inside and out, can be used on the couch, for camping, sleepovers, in bed, in the car - anywhere! √Lovely Design: The creative cuddly mermaid tails blanket with bright color and beautiful cable knitted pattern to complement your living room or bedroom. Let you enjoy the leisure time gracefully. This blanket is lovely, it's even nicer than I expected it to be. The colour is absolutely gorgeous, and the scale effect pattern looks great. It's very soft and perfect to snuggle up with on the sofa. It's not overly thick, but it is warm enough and is ideal for me - any thicker and I'd probably overheat. Size wise, it is plenty long enough for an adult to use. It covers me comfortably with no gaps to let cold air in. It's also ideal for children or teenagers, my daughter loves cuddling up in it. The blanket is well made from good quality yarn, so I think the price is about right. At just under ten pounds, it's good value. A beautiful blanket that is a must for all budding mermaids! Five stars!